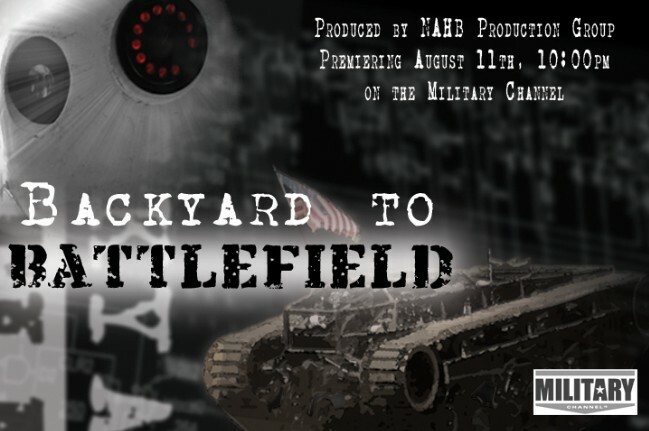 As I was channel surfing this morning I ran across a program on the Military Channel called Backyard to Battlefield. I came in about halfway through the episode but it IMMEDIATELY caught my attention. If you are not familiar with the show it features “outsider” defense contractors made up of small teams that are often times working out of their garages or workshops. This of course is a stark contrast to the more common (and MUCH larger) military contractors. The show featured two projects that were VERY interesting. It turns out that BOTH of them were designed in SolidWorks! The Howe brothers of Howe and Howe Technologies from Maine have designed a truly remarkable vehicle called the Ripsaw MS1. Even though it has “tank like” tread, it’s design enables it to handle almost any terrain and reach speeds around 80 mph! You can see it in action in this YouTube Video. The second project show was the BEAR life saving robot from Vecna Robotics. 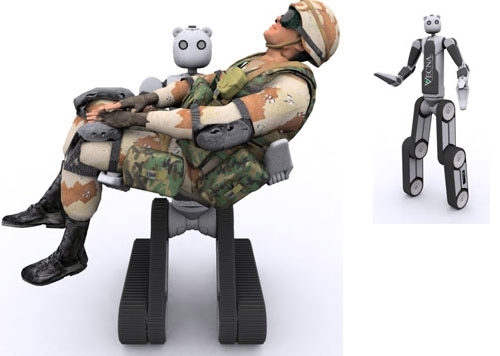 The BEAR is designed to balance itself on two legs while picking up a 200 pound mannequin (or later on an injured soldier)! 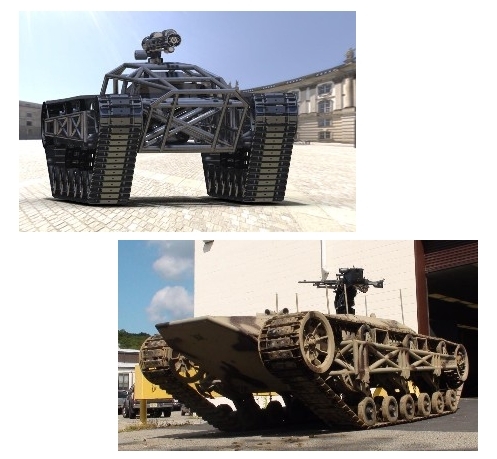 It uses hydrualic power in combination with various tracks to rescue wounded soldiers in the field. Towards the end of the episode the BEAR team discovers a failure in one of the hydraulic units. One of the team engineers is then shown bringing up the SolidWorks model of the hydraulic unit and the results of a SolidWorks Simulation study that predicts a high stress in the area where the cylinder ruptured. The BEAR team also used physics based simulation programs to predict how the robot would perform based on the programmed movements. Very cool stuff! According to the Military Channel website, this is the premiere episode of the series. This looks like a show you want to keep your eye on for sure. Also – For all of you Discovery Channel geeks out there – Don’t miss the premiere of Prototype this coming up this Wednesday. You can check out Josh Ming’s post over at SolidSmack about that series HERE. awesome Ricky. 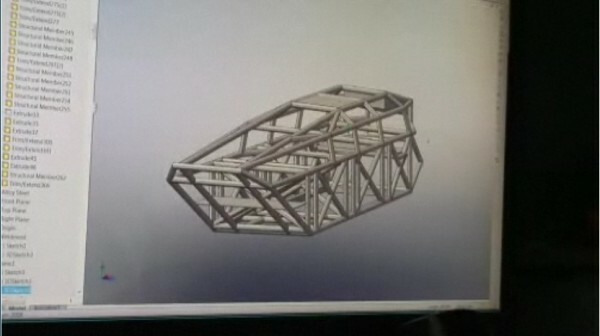 I love it when they actually show what CAD programs are used to create stuff. to bad it was deleted but at least it's on the website. The robot is cool too. a robot created to save life and not destroy it… yet. Glad you posted this. It's amazing what fertile minds can create with SolidWorks. we've got to figure out what they are doing with that flat pattern for that tube cutter. Yeah…that flat pattern trick is REALLY cool. Looks like all they are doing is inserting the solid body (structural member) into a new part file, then cutting a split into it. From there all you have to do is use insert bends to unroll it. They can then feed the flat pattern profile into the CNC laser cutter. All you have to do is synch up the feed rate with the rate of rotation of the tube. That's the part I was really impressed with. Props to the Howe brothers for coming up with that. Really innovative! I wonder whether you have interest in running your own Military dating site or work-at-home business. We would like to work with you setting it up. You can pick the name for your own Military dating site at Godaddy.com , own the domain and brand. We take care of all the backend and engineering work. Also customer service work. You can earn money if you can get users registering at your Military dating site. Pretty interesting gadgets. I like it. Cool looking prototype with a lot of potential uses. 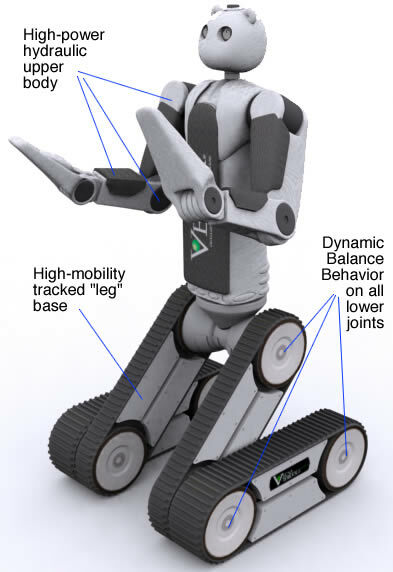 The high-mobility tracked leg base provides a variety of advantages for this robot that others don't have. Very nice design and concept it could potentially be a life saver if you out this in the battle field. Is this already approve for mass production? these machines were really great, this seems to be true that the robots are more strong than human sometimes.